Edition of the returns made by English merchants, recording the transactions of foreign traders. The “Views of Hosts” is the name given to the returns which merchant “hosts” in London, Southampton and Hull were required to provide for the Exchequer. They listed the imports and purchases made by their foreign merchant “guests”, who came mostly from Italy, Spain and the Low Countries. The returns, printed here in full for the first time, provide details of the goods traded in and out of these ports, and also the names of the foreign merchants, and of the local men and women who bought their wares and sold English goods to them in return. 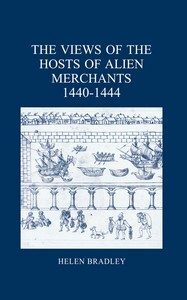 The volume thus not only throws light on individual merchants and craftsmen living and working in these ports, but will also be of interest to those concerned with the patterns and practices of English trade in the fifteenth century. The returns themselves are complemented with full apparatus and notes; introduction; biographies of more than 500 English people mentioned in the texts, as well almost 130 foreign merchants; and a glossary of commodities.